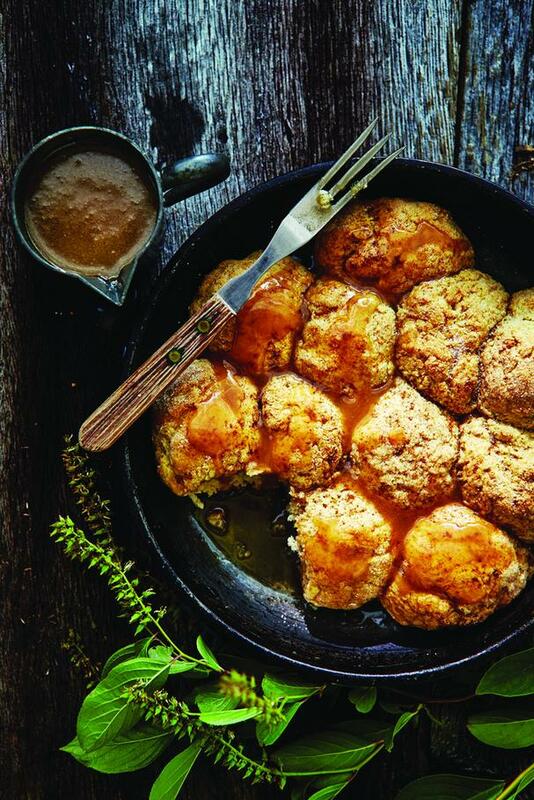 If you love monkey bread (those sweet gooey pull-apart cinnamon balls), then you'll love this one-skillet campfire version. A simple dough of butter, Bisquick, eggs, milk, sugar, and cinnamon is mixed together, shaped into balls, then rolled in a brown sugar-cinnamon mixture. The balls are then placed in a buttered cake pan and baked in a Dutch oven over a camping stove of campfire for about 25 minutes. Serve the cinnamony bites topped with an easy sauce of brown sugar, butter, and milk and enjoy their finger-lickin' goodness. This delicious recipe is from our feature of The Outdoor Adventure Cookbook by Coleman. Get 3 more delicious campfire recipes here, like a S'Mores Cookie Cake; Canadian Bacon, Tomato, and Egg Campfire Stacks, and a Southwest Chilaquiles Skillet Breakfast. All are made in just one skillet! Excerpted from The Outdoor Adventure Cookbook by Coleman. Copyright © 2017 Oxmoor House. Reprinted with permission from Time Inc. Books, a division of Time Inc. New York, NY. All rights reserved. 1. Heat a camping stove to medium (about 350° to 375°F), or fit a grilling grate over the direct heat of glowing embers. Cut 6 (18-inch) squares of aluminum foil; crumple each square into a 11⁄2- to 2-inch ball. Arrange the foil balls on the bottom of a 71⁄2-quart cast-iron Dutch oven. Cover with the lid, and preheat on the camping stove or grilling grate directly over the heat source 10 minutes. 2. Meanwhile, grease a 9-inch round cake pan with 1 tablespoon of the melted butter. Stir together the baking mix, egg, 2 tablespoons of the granulated sugar, and 1 1⁄2 teaspoons of the cinnamon in a bowl. Add 2 tablespoons of the melted butter and 6 tablespoons of the milk; stir until a soft dough forms. Combine the remaining 3 tablespoons granulated sugar and 1⁄2 teaspoon cinnamon on a plate. Shape the dough into balls, using about 1 heaping tablespoon of dough for each. Roll in the sugar mixture on plate, coating all sides. Place the coated dough balls in the prepared cake pan. 3. Using tongs, lower the greased cake pan onto the foil balls in the preheated Dutch oven. Cover with the lid, and bake until the biscuit bites are done, 25 to 30 minutes. 4. Stir together the brown sugar, remaining 7 tablespoons butter, and remaining 2 tablespoons milk in a saucepan. Bring to a boil on the camping stove or grilling grate, and cook, stirring constantly, 2 minutes. Serve the warm sauce with the biscuit bites.